I made this piece specifically to mess with my youngest sister. She’s a fan of thresh and I wanted to make something iconic to lord over her, because even as an adult, I’m still a big brother. I found a model of the lantern on my mini factory that looked like it would work out. The first problem was that the model was broken and needed some repair. After that, I wanted to make it really big, so I enlarged it several hundred percent and then sliced it into pieces to fit my printers and not require any support material. The base is about 28 cm (11 inches) square and the whole thing stands about 46 cm (18 inches) tall. Because it has such long lines, some of the corners curled up even with PETG, so this piece is going to require a lot of filling work. First up though was putting it back together. I sanded down each piece to hit all of the high parts and make finish sanding a bit easier before I glued it all together. After the 5 minute 2-part epoxy dried, I decided to then coat it with a layer of XTC-3d to again try and ease the finish sanding. I don’t usually use XTC, but I need every advantage I can get on this one since I printed it with .48mm high layers and a .6mm nozzle . start to paint, miss a spot, sand. It goes on like this for awhile. But eventually I hit the final base coat. After it dries for awhile, we get to the fun part, detailing. This is where it really starts to come alive. I knew I wanted this thing to glow, and I mean glow a LOT, so I ordered some glow in the dark powder and glow in the dark paint from amazon to test out. I mixed the powder into a clear varnish base and, something odd happened. It turned pink. It went back to clear though once it dried so I just assumed it would be a one off thing and carried on. That’s an odd color of clear…. I filled the cavity in the top of the lantern with the glow mixture and then painted the corners all around the lantern so the outline would really pop. OK. this idea might work. It wasn’t until I filled the bottom of the lantern that I realized I had a problem. Not only was the varnish staying pink, it was refusing to dry and all of the powder had settled out of it. I had to scrape the goop out of the lantern the next day. The best part about these projects is that, 99% of the time, the mistakes end up being the highlight of the piece. This one is no exception. 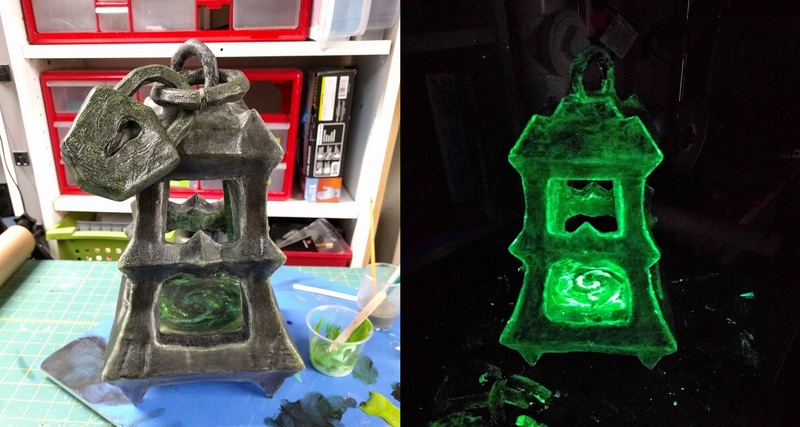 Because I had to start over with the paint instead of the glow powder, I ended up painting the entire lantern which created this really neat stone like texture across the whole thing AND made the entire lantern glow. I also had enough left over that I could gloop it on pretty heavy in the bottom of the lantern and create the swirl effect that really shows up nice in the dark. It’s been 2 days…it’s still pink. The glow poweder goes on white, so I followed it up with a very thin wash of black acrylic that was light enough to be transparent but dark enough to hide the white. I then went back over the edges to create the highlights and the outline. One last coat of satin poly and we have our lantern. Here is a video that hopefully shows just how bright this thing actually glows.